Trapezius muscles are the large sized muscles in human body which covers a large area beginning from occipital bone and extending to lower thoracic vertebrae and alongsidecovers to the shoulder blade or scapula. This part helps in maintaining arms’ weight on body. This part draws back scapulae. This area helps in rotating as well as depressing scapulae. The traps are flat, smooth and 3-sided muscles which enable them to cover 3 body areas i.e. shoulders, thorax and back area of the neck. Origination, movement or rotation of shoulder blade, which is commonly known as scapula, is possible with acting of upper and lowers parts of traps which enable this process as the upper part functions to raise shoulder and supports to control the weight. Whereas the lower part draws back shoulder blade to descending position, and when both of the parts work together, they enable scapula to move toward body and help head to draw to backward position. As mentioned above that the main function of traps is to help in moving the neck, head and shoulders into different directions, it is really important to know what could be the effects of traps on neck and other areas. 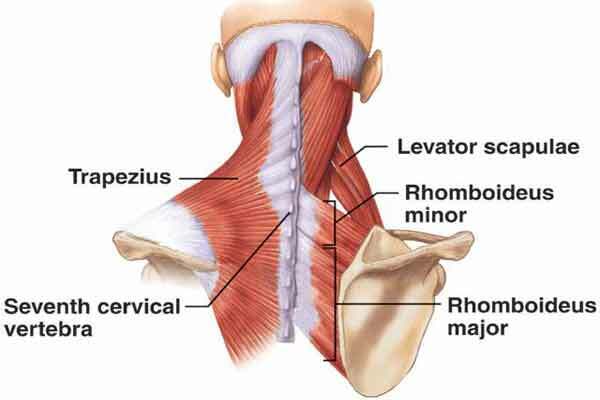 The looseness or tightness of trapezius muscles directly affects flexibility of neck and those who have to sit for long hours in front of computer screen or at the work desks or drive on longer routes usually have problems and upper muscles on shoulders become painful or sore. Another important function is that they also aid in breathing by creating space in upper area of chest and that’s why they are also called breathing muscles. If you want to relieve pain management issue in your neck and back, you had better not to depend upon such muscles completely as you might have to get narrow breathing; therefore, it is always advised to depend upon diaphragm which is the main breathing muscles and creates great space in torso. If someone has an injury in accessory nerve, this might lead to the atrophy and paresis. The major symptom of this disorder may be reduction in the ability to adduct shoulders. In case of atrophy or paresis, lifting or elevation of arms is restricted below 90 degrees and the affected shoulder side also gets lowered. Accessory nerve injuries are very common and they often occur during their involvement in cervical region. Neck and shoulder massage to bring relief is very popular and the main reason of its popularity is its effectiveness and the simple ways to do it. If you want to do the massage, you can simply give a try to reflexology with your own fingers while your whole hand is involved in kneading. When you put pressure on traps with your palms or knuckles and touch your fingers to the certain body area and move in a circular motion, this works great to provide relief. You should also remember that the massage should be done equally on both of the sides. Don’t do it in a rush but begin with gentle touch and gradually increase pressure to soften and warm up muscles. You must also know that if you put extraordinary pressure in the beginning, this may damage your muscles; therefore, you should be very careful while performing this action. Those, who happen to cause sore to trapezius muscles, may also use this massaging technique to get relief from sore as well as pain. Massage is a good practice which can provide great relief, but you must know that your traps should be trained properly so they don’t get injuries in future. For this purpose, you can use various exercises and yoga stretches which will help you in making your traps healthier, stronger and bigger and some of the exercises will also help in increasing flexibility. Doing stretching is considered to be another effective way to deal with the tightness of upper trapezius muscles and the best thing about these stretches is that you can easily perform them at the comfort of your own home without going to a fitness gym or hiring the services of a professional fitness expert. How to Stretch Upper Trapezius Muscle? To stretch your upper trapezius muscle, you simply need to sit on a chair while your head is turned to 45 degrees to your right side. Now slowly and carefully lower down left ear to left thigh. Try lowering your ear until you begin feeling a light stretch in opposite side of your neck and upper shoulder. When you want to increase the stretch, you can try to lift your left hand over your head while giving light pressure on right side. Thirty seconds would be great enough for a stretch for one side and this can be performed 3 times a day.